From an award-winning author, a sweeping history of our transformative relationship to light. In Brilliant, Jane Brox traces the fascinating history of human light from the stone lamps of the Pleistocene to the LEDs embedded in fabrics of the future—and reveals that the story of light is also the story of our evolving selves. As Brox uncovers the social and environmental implications of the human desire for more and more light, she captures with extraordinary intensity the feel of historical eras: the grit and difficulty of daily life during the long centuries of meager illumination when crude lamps and tallow candles constricted waking hours; and the driven, almost crazed pursuit of whale oil and coveted spermaceti across the world’s oceans. She indelibly portrays, too, the emergence of a vibrant street life under gaslight, a new illumination which not only opened up the evening hours to leisure, but also fundamentally changed the ways we live and sleep. These changes became all the more pronounced with the advent of incandescent light, as Edison’s “tiny strip of paper that a breath would blow away” produced illumination that seemed to its users all but divorced from human effort or cost. And yet, as Brox’s informative, chilling portrait of our current grid system shows, the cost is ever with us. Brilliant is a compelling story imbued with human voices, startling insights, and—only a few years before it becomes illegal to sell most incandescent light bulbs in the United States—timely questions about how the light of the future will shape our lives. > Click here for information on the BRITISH EDITION of Brilliant. 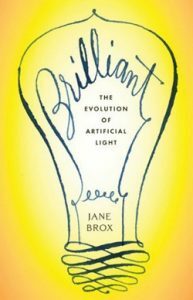 > Jane Brox talks about the history of light on Planet Money.